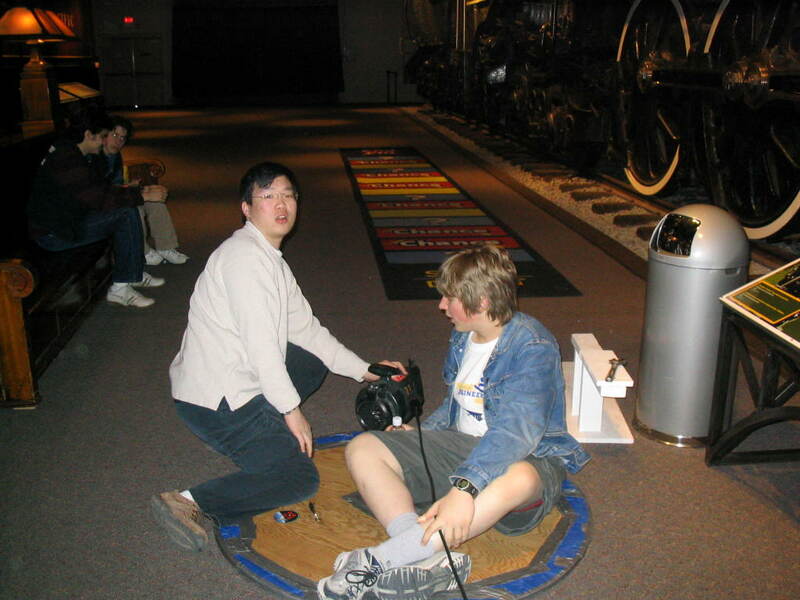 Brian Foo and Matthew Farkas-Dyck testing the hovercraft at the Museum of Science and Technology's International Day of Astronomy festivities in 2007. The hovercraft is one of Spacesim's creations. It is made of plywood, a tarpaulin, and duct tape, and is powered by a leaf blower. It is often used for the club's Week of Hype, demonstrating the building aspect of Spacesim, as well as how fun and cool science is. The hovercraft has existed, in some form or other, for many years; there are pictures of a triangular one from the mid-90s, but the current model is circular. In September 2009, after the hovercraft was used during the Week of Hype, there was so much wear on the tarpaulin that a new one was attached in its place. This page was last modified on 5 June 2010, at 15:48.